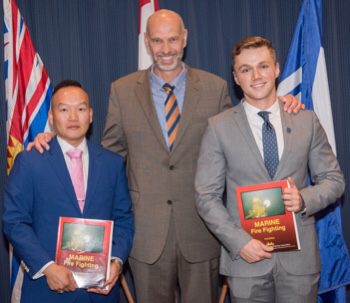 On July 22nd Captain Joachim Ruether MNI, on behalf of the Nautical Professional Education Society of Canada (NPESC), attended the Convocation Ceremony for graduates of the British Columbia Institute of Technology (BCIT) Marine Campus Nautical Science and Marine Engineering Diploma programs. There have been 14 such annual ceremonies and the NPESC has made book presentations at every one. At the first ceremony in 2003 the NPESC was the only organization to present an Award. The Vancouver Conway Club joined them in the second year. Since then the list of presenters has slowly grown to the list shown here. The Master of Ceremonies on this occasion was Yvette Myers, Regional Director, Marine Safety & Security Pacific, Transport Canada. She introduced various speakers from BCIT and then the Class Valedictorians for the Nautical Science and the Marine Engineering Classes. Graduation Certificate presentations followed. Included in the Nautical Science graduates were five who had won NIBC Scholarships with funds provided by the Vancouver Transportation Foundation. The major awards came from three shipping companies, Oak Maritime, Transport Desgagnés, Inc., and Algoma Central Corporation. The Oak Maritime Group of Companies is involved in the deep-sea transportation of raw materials. Oak Maritime established its operational headquarters in Vancouver as a result of the International Maritime Centre initiative, which encouraged the relocation of international ship owners and managers to British Columbia. Each year Oak Maritime through the V.K. Eddie Hsu Foundation makes donations to the BCIT Foundation to provide financial awards for top Marine Campus students in their first and fourth years. On this occasion the Oak Maritime Award for Nautical Science went to Dylan Fowler, a Director of the British Columbia Branch of The Nautical Institute (NIBC). 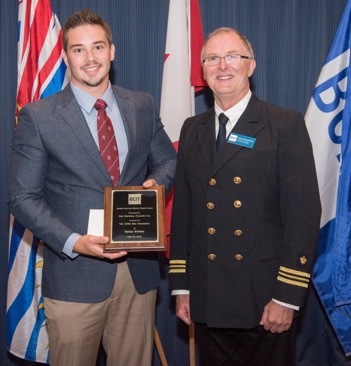 He is shown here receiving his award from Captain Philip McCarter, Associate Dean of the BCIT Marine Campus. Serge Le Guellec, the President and General Manager of Transport Desgagnés, was on hand to make presentations to four graduates who had served their seatime on Desgagnés’ ships. The Algoma Central Corporation provides awards for a student with high academic marks in both the Nautical Science and Marine Engineering programs. The NPESC Awards went to Jordan de Brouwer and Phillip Li, seen here receiving their books from Captain Ruether, the Secretary/Treasurer of the NPESC. Members of the NIBC founded the Nautical Professional Education Society of Canada in 1995 to provide financial assistance to Canadians pursuing a career at sea. This year the Society will provide 6 x $1,000 Bursaries for eligible students at Nautical Schools in British Columbia. One of the Founding Members of the Society is Captain David Snyder, the current President of The Nautical Institute.